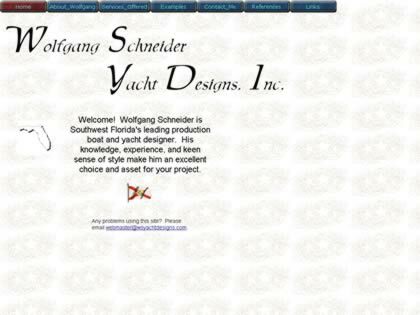 Wolfgang Schneider is Southwest Florida's leading production boat and yacht designer. His knowledge, experience, and keen sense of style makes him an excellent choice and asset for your project. Web Site Snapshot: If available, above is a snapshot of the Wolfgang Schneider Yacht Designs web site at http://www.wsyachtdesigns.com as it appeared when this site was added to the directory or last verified. Please Note that Boat Design Net has no involvement with the above web site; all content and images depicted in the above thumbnail are the property and copyright of Wolfgang Schneider Yacht Designs unless otherwise noted on that site. Description: Wolfgang Schneider is Southwest Florida's leading production boat and yacht designer. His knowledge, experience, and keen sense of style makes him an excellent choice and asset for your project.